We are into the end of the first week of the garbage strike in Vancouver and instead of the standard photo of smelly garbage mounting up and rats breeding, we have...people composting! It's a fact; all of the big hardware stores in town have almost sold out of composters. Amidst warnings that the strike could go on for weeks, City officials are encouraging residents to step up their recycling efforts and people seem to be getting the message. 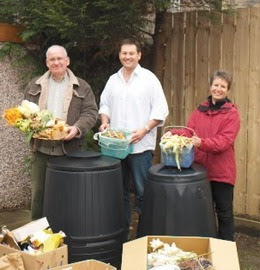 Since about half of household garbage is organic material, much of it can be composted in a backyard composter. For those in apartment buildings, of which there are many in Vancouver, things could be a bit more difficult. However condominium dwellers are being urged to get into the habit of rinsing out recycleable tins and jars as a start.